From 4 – 6 December 2017, the 3rd Session of the United Nations Environment Assembly (UNEA-3) was hosted at the UN Environment Headquarters in Nairobi, Kenya. In the lead-up to the assembly, the GEMS/Water Unit organised a session at the first Science-Policy-Business Forum on the Environment, held from 2 – 3 December 2017 under the banner ‘Science for Green Solutions’. Aim of the forum was to identify and promote opportunities for green investment that are driven by advances in science and technology, empowering policies and innovative financing. The 60 minutes long session ‘Water Quality Monitoring — Opportunities for engagement from the private sector, science community and civil society’ discussed water quality monitoring work being done by countries, the private sector, citizen science and earth observations and embraced a variety of perspectives and data sources to track water pollution changes. The session was attended by over 100 visitors and led to lively discussions on how technologies such as Earth Observations and affordable, portable water testing devices can help to fill the data gap and promote data exchange. The session also stressed the importance to involve the private sector in finding solutions for a sustainable water future through innovative business models. Philipp Saile from the International Centre for Water Resources and Global Change successfully contributed to the session as panelist. Further activities of GEMS/Water during the Science-Policy-Business Forum and UNEA included a well-attended exhibition stand – which was also visited by the Irish Ambassador to Nairobi, Dr. Vincent O’Neill – and a field trip for international journalists to three different locations along the Nairobi River. The field trip was an opportunity to showcase different approaches to and technologies for water quality monitoring by different stakeholders and allowed the GEMS/Water experts to discuss the importance of water quality monitoring with international science journalists. Another highlight for the GEMS/Water team was the official adoption of the Resolution UNEP/EA.3/L.27: “Addressing water pollution to protect and restore water-related ecosystems” by UNEA on 6 December. The GEMS/Water Global Programme Coordination Unit was involved in the work leading to the official adoption of the resolution. 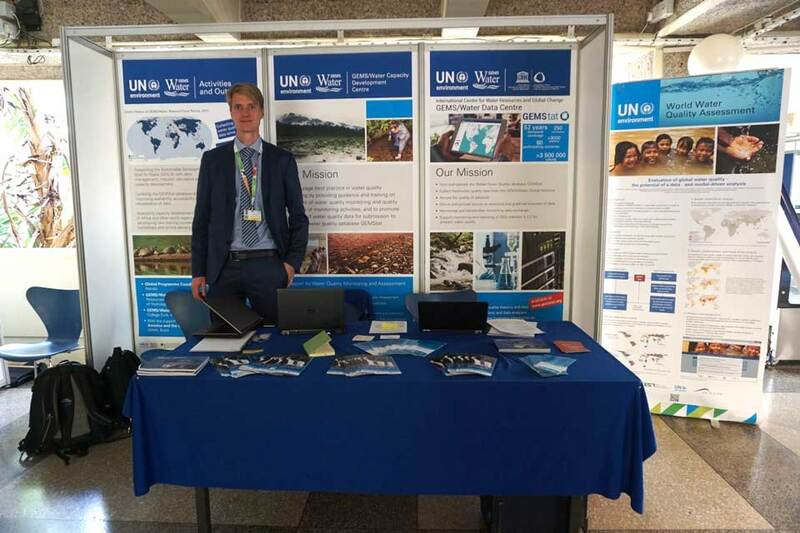 During the Open-Ended Meeting of the Committee of Permanent Representatives as well as UNEA itself, GEMS/Water provided a resource person for technical questions and a screen editor during the consultations. Resolution 3/27 reiterates and expands the mandate of the GEMS/Water Programme previously reaffirmed by Resolution 1/9 during the first UNEA in 2014. The newly adopted resolution acknowledges the growing need for developing and maintaining capacities in water quality monitoring. It further encourages Member States to support GEMS/Water in evolving into a broader data and data service provider and to become a capacity development hub for water quality and related SDGs monitoring, as well as for assessments of thematic and integrated nature.